In late 1952, the sole RAAF contribution to the defence of Darwin was two Wirraways, a Lincoln bomber and a Dakota. The Lincoln was on two-weekly rotation from Townsville for the purpose of SAR standby. A few weeks before my first arrival at Darwin, one of the Lincoln pilots, Warrant Officer Jack Turnbull - a former Spitfire pilot, wrote off a Wirraway in a crosswind landing. The Wirraway was tricky to land in crosswinds and Jack had lost control and ground-looped seconds after touch down. He exited stage left quickly as it caught on fire. The CO of the base, former Catalina pilot Wing Commander “Bull” McMahon, was none not too happy at losing the Wirraway, effectively reducing Darwin’s airborne defence capability by half. The Dakota and Lincoln didn’t count because they had no guns. Having recently flown Mustangs, I prevailed upon the Wing Commander to let me fly his remaining Wirraway, on what we termed continuation training. In reality, that meant buzzing herds of buffaloes in the plains to the east of Darwin and scarping at 50 feet above dozing crocodiles in Arnhem Land. To make the trip strictly legal we would carry out a VHF DF (Direction Finding) instrument approach on returning to Darwin an hour later. In turn this gave the RAAF air traffic controller practice at bringing aircraft in to land in bad weather. While based in Darwin I became friends with a Sergeant reservist pilot called George Petru. In 1948, George had escaped the communist regime that had taken over his native Czechoslovakia and after many adventures eventually arrived by ship in Darwin where he found a job as a surveyor with the Department of Works. Previously he had flown Junkers 87 (Stuka) dive bombers with the Czech Air Force. Faced with marauding Russian troops, he stole a Messerschmitt ME109 fighter and fled his homeland chased by Russian fighters. The ME109 was a fast German designed single seater, which enabled him to out-run his pursuers. Perhaps more out of admiration of his exploits than pressing need, the RAAF accepted him as a reservist and George was given RAAF pilot wings despite never having been flight tested to service standards. He loved Australia and having read of the exploits of the RAAF fighter ace Bluey Truscott, was so impressed that he changed his name by deed poll from Petru to Truscott. George came along on many Lincoln sorties but he was not allowed to land or take off. He had never flown a heavy bomber and understandably was pretty ropey on instrument flying. For that reason we would only let him at the controls when the sun was shining. For all that, George was one of the most enthusiastic pilots I have ever flown with and he would willingly come along as a crew member on some of our long ten hour SAR sorties. Our Lincoln crew with George Petru, the Stuka pilot, at far left. 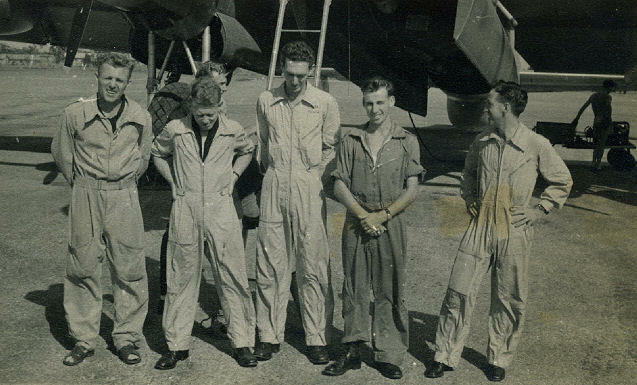 John Laming is second from the right. One day I rang George at work and asked him would he like to come with me in the Wirraway for low flying practice - meaning chasing hapless buffaloes. I saw my mate the big bull buffalo as a hairy cloven - footed version of Jaws, in need of a bit of stirring up - from a safe height, of course. George was delighted to get into a single engine aircraft again – his last one being the Messerschmitt hijacked from the Czech Air Force. After kitting him out with a parachute and mae west life jacket we took off in the Wirraway, heading east to find the herd. Sure enough we found the old bull buffalo and George took a few photos of him from the relative safety of the back seat of the Wirraway. After that, we followed river tributaries towards the coast for more low flying along deserted beaches to the east of Darwin. This was more dangerous than chasing buffalo because it was here that huge salt water crocodiles lay in wait for unsuspecting wild pigs and dogs. Perish the thought of an engine failure here. 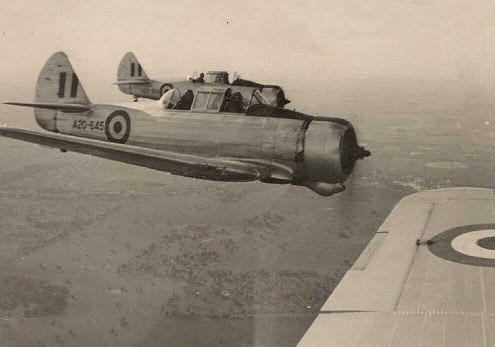 George of course occupied the back seat of the Wirraway and was unable to see forward beyond my head in the front seat. For this reason I decided it would be unwise to hand over control to him while low flying. In the event, this turned out to be one of my better decisions in life. Having made rude gestures to the crocodiles and with plenty of fuel remaining, I climbed to 5000ft for some aerobatics. After completing a few barrel rolls and inadvertently spinning off a roll off the top, I handed over to George in the back seat, inviting him to try a loop. Now you must remember that George had never flown a Wirraway before and therefore had no idea what a vicious beast it could be if roughly handled. After a clearing turn I talked George into the initial dive at 160 knots then told him to pull up and over into the loop. In the excitement of the moment, I must have forgotten that George had flown the Stuka - an aircraft specifically designed as a dive bomber. The typical dive angle of a Stuka was sixty degrees and the drag from its huge wing dive brakes kept the speed back to eighty knots. The stick force needed to pull out of the dive in a Stuka was not much at all and a harsh pull back on the stick at the bottom of the dive would easily convert the dive into a rocketing climb. Well, all I can say is that a Wirraway is not a Stuka and it quickly showed George who was boss. George reefed about 4G at the bottom of the dive, causing the Wirraway to flick violently into a series of high speed vertical rolls and bouncing George’s head against the side window panels. I attempted to take control from the front seat to counteract the inevitable incipient spin. In the flurry of swear words from both cockpits George had not understood my polite request for him to let go of the controls, and kept hauling back. And so the Wirraway stuck it right up him and kept on flick rolling. Eventually he let go of the stick and after recovering from the last known inverted position, I abandoned the sortie and we flew sedately back to base. Safely on the ground, George muttered ruefully that flying Stuka dive-bombers was a damn sight safer than aerobatics in a Wirraway and thanks very much for the offer but in future he would rather give Wirraways a miss, and stick to flying Lincolns in sunny weather. Some Lincoln crews were irritated by his fractured English, and fanatical keenness to fly. As a result, he was often knocked back after turning up at the airport. When that happened he would walk away sadly, knowing he was not wanted. Few knew that he was a brave man that had seen bloodshed and murder in his home country. It took great courage to steal a Messerschmitt and risk being shot down in a hail of cannon fire, and I felt small in stature against this man. For my part, I could rarely find it in my heart to knock him back when he turned up in his flying suit, cloth helmet, and a big smile. 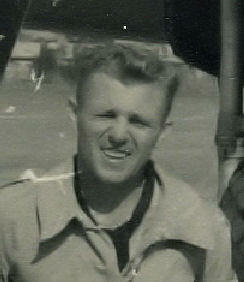 As I saw it, he was in the RAAF reserve and trying hard to do his bit for his new country. When the last of the Lincolns went to the wreckers in 1960, George had logged over 200 hours in the right hand seat. From Darwin he moved with his family to Canberra. His English improved steadily and eventually he obtained his private pilot’s licence. A few years later, George made media headlines after getting lost near Oodnadatta in his Cessna 172 and forced landing on a clay pan. He was on his last legs when he was located, badly sun burnt, after surviving for one week by chewing his leather belt and shoe laces and eating toothpaste. I'd like to thank John Laming for his assistance with this web page.